OnSync is a useful, trial version program only available for Mac, that belongs to the category Utilities with subcategory Synchronization. Since the program was added to our catalog in 2006, it has reached 75 downloads, and last week it gained 0 downloads. This program is available for users with the operating system Mac OS X and prior versions, and you can get it only in English. Its current version is 1.17 and the latest update was on 9/03/2007. 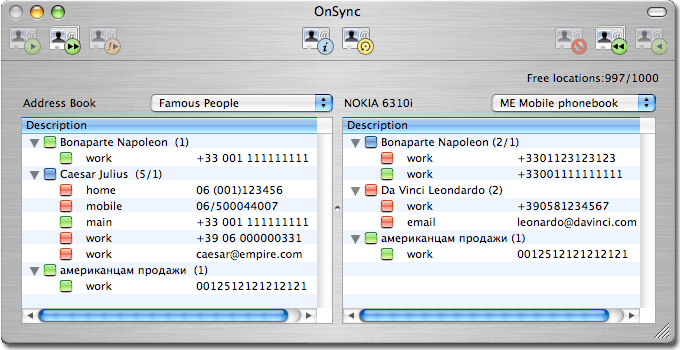 OnSync is a software that requires less storage space than many software in the section Utilities. Compatibility list updated (Samsung, Motorola, Nokia) Added Leopard compatibility (Mac OS X 10.5) Solved some minor bugs. What do you think about OnSync? Do you recommend it? Why?